This treatment works well for softer greens, including tender kale, and would also work for briefly simmered collards or tough kale. I made one batch with rainbow chard this week, pictured below, and a separate batch using beet greens, arugula, and radish tops. 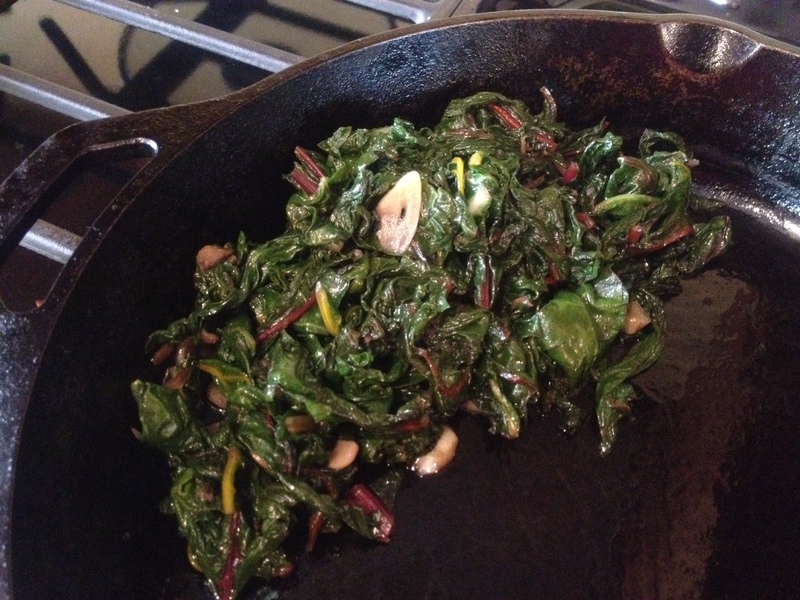 Whatever greens you use, start with a lot; one bunch of greens looks awfully puny after a few minutes in the pan. Sauteed Greens with Garlic: Wash and roughly chop a bunch (or a few bunches) of greens, leaving some water clinging to the leaves. Heat a swirl of olive oil over medium-high heat and add a few cloves of sliced garlic. Stir for a minute to release the garlic aroma without letting it brown. Add the greens in batches as big as your pan can handle, sprinkling each addition lightly with salt and allowing it to wilt a bit to make room for the next batch. When all the greens have been added, saute until the greens give up their liquid and it has mostly evaporated. Taste for salt and add more if needed. I usually stop there, but if you feel like your greens need a little something else, a few drops of vinegar (I like sherry vinegar with greens) will brighten the flavor. I forget about sauteed greens, but I love them! Thanks for the recipe. We are in the throes of summer here, with tomatoes, eggplant and melon in high season, but when the fall greens come in I’ll be ready! Aaah everything you make looks divine – I look forward to keeping tabs and picking up pointers! Thumbs up from me! I just love Swiss chard (I think it’s the rainbow stems that get me). I usually add a little onion or shallot to the saute pan to give it a kick. Ah, simple and delicious, just what I need! Thanks Emmy! It is mad crazy how many greens it takes to get a significant amount of sautéed ones. Good way to use them up though! And I forgot to mention something in an earlier post that you wrote about keeping windows open on your computer with recipes. I have this problem too! I just have bookmarks everywhere! After a while, I wonder if I need bookmarks for my bookmarks . . .
I’ll have to try vinegar some time, usually go for cream or meat jus (sorry) to take the edge off. I’m so glad to know there are other people out there as obsessive about triumphing over their CSA boxes as I am! My favourite thing to do with a bunch of greens! There are so many possibilities. I’ve been known to throw in some crumbled goat cheese and pine nuts at the end too. Good suggestion with the vinegar, I’ll try that. This is one of my favorite go-to greens recipes. I really like using sesame oil, too. Works well with the bitter greens. Thanks for posting great recipes!